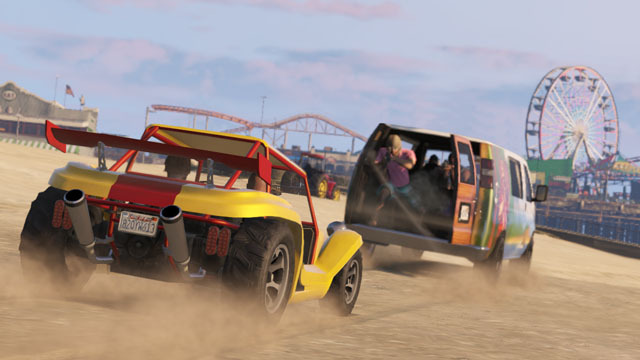 Rockstar has given us an update on what they have in store for us in GTA Online. Thank you to everyone for joining in GTA Online throughout this first month of its release, for all of your awesome Online Snapmatic pics and Crew videos that we’ve spotted, for your patience and understanding as we’ve been working through the initial teething issues of launching an online experience like this, and for your excellent feedback to the official [email protected] email address. Please keep it coming as it is really helping us plan for the future of the game. Here’s a quick update for all Grand Theft Auto Online players worldwide on what’s in store in the immediate future. Starting in November will be the first Grand Theft Auto Online Social Club Event weekends which will bring special rewards and bonuses ranging from limited-edition in-game Event Crate Drops to in-game discount specials and even a special new GTA Online live-stream show hosted by Rockstar at the Social Club Events page and Rockstar Games Twitch page – plus prize pack giveaways of hard to find GTAV gear and more. Discuss this GTAO in the GTA Online forums and discuss everything else in the rest of the forums! A survival zombie mode wouldn't be bad along side an Alien survival mode, They would give all players best of both worlds, You can't say it wouldn't be fun with the game mechanics. no zombies!!!!!!!!!! god no zombies!!!!!!! you want zombies go play a nuther gay!!!!!!!!! an lets get the hiests already damn ! You Guys really dont want zombeis?? and i wouldnt mind Aliens or some Goverment sercet stuff all above songs Godd would u agree? I reckon it won't be zombies but aliens. Everything in game points to that outcome. In RDR weren't locals talking about zombies before the expansion pack. Grand Theft Auto Online Update - Rockstar has given us an update on what they have in store for us in GTA Online.